UK supermarket chain Morrisons is selling rainbow roses to support homeless LGBT+ youth this Valentine’s Day. Morrisons have partnered with The Albert Kennedy Trust, a charity devoted to supporting homeless LGBT+ youth, in launching the special flower. The rainbow roses will be available for sale at all Morrisons stores starting February 11. The retailer will donate 50p per rose to the charity, which was selected by Morrisons LGBT+ network. The retailer intends the roses, which have been dyed so that each petal displays the colours of the rainbow, to be a celebration of all types of love. 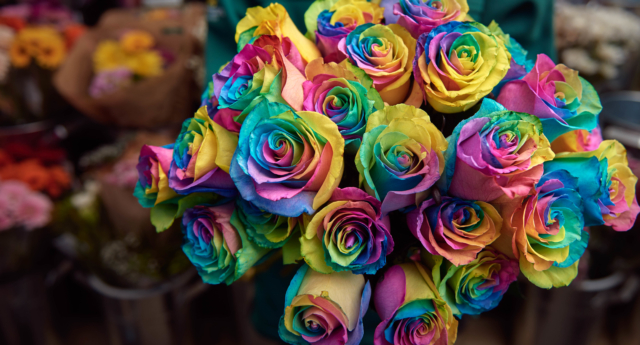 Inspired by the rainbow flag symbolising the LGBT+ community, Morrisons florists cut the rose stems and dip each part into a different coloured water—which are absorbed by the flower to turn each petal into a different vibrant colour—including blue, yellow, green, violet and pink. The Albert Kennedy Trust director of fundraising Carrie Reiner thanked the retailer for the partnership. How many young LGBT+ people are homeless in the UK? In 2017, it was estimated that nearly 45,000 people aged between 18-24 in the UK had approached local authorities to seek assistance. According to The Albert Kennedy Trust, around a quarter of young people at risk of homelessness identify as LGBT+. Reacting to the government’s action plan to combat rough sleeping unveiled in December, The Albert Kennedy Trust chief executive Tim Sigsworth said fighting homelessness required more than just providing safe homes. Sigsworth said in a statement: “Young LGBT+ people are uniquely at risk of homelessness and are often more vulnerable than their cisgender straight peers. Our national scoping has shown that 77 percent of young LGBT+ people who have faced homelessness say that this was the result of family rejection or abuse.